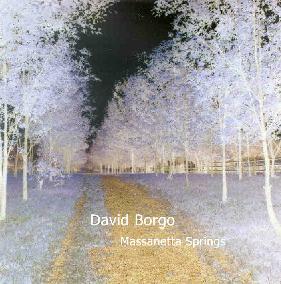 David Borgo - "Massanetta Springs"
David Borgo is a saxophonist, composer and music professor who plays a fairly standard but enjoyable brand of jazz. The theme of Massanetta Springs is the two years in the late 1990's when Borgo relocated to the Shenandoah Valley of Virginia to begin a professorship at James Madison University. The music is easy going, though throughout the album we get plenty of fire, as well as passionate serenity. There's nothing stylistically challenging here, but for what it is the compositions and playing are outstanding. The rhythm section of Mark Ferber on drums and Pete Spar on bass (Roberto Mirando handles bass on two tracks) is more than capable. Some of the more interesting moments for this listener are the interplay between Borgo's sax and Wilson's guitar. Only 21 years old at the time of this recording, Wilson is an excellent jazz guitarist with a light but highly skilled touch that focuses more on the color and character of his voice than flash. There are various configurations of musicians across the album's 10 track, and other highlights are the 3 that include the fuller horn trio of Borgo, John D'earth (trumpet) and Alan Ferber (trombone). Among my favorite tracks are the Dave Holland penned "Conference Of The Birds", and "Oddity", which is one of the most exciting pieces of music on the album. "Pomodori" is another highlight, with healthy doses of swing, and the only track to include David Pope, whose alto sax beautifully compliments Borgo's tenor. Overall, a very nice set of music. Some of it was a bit mainstream for my tastes, but Borgo and company are clearly capable of covering many of the styles that span the jazz spectrum.